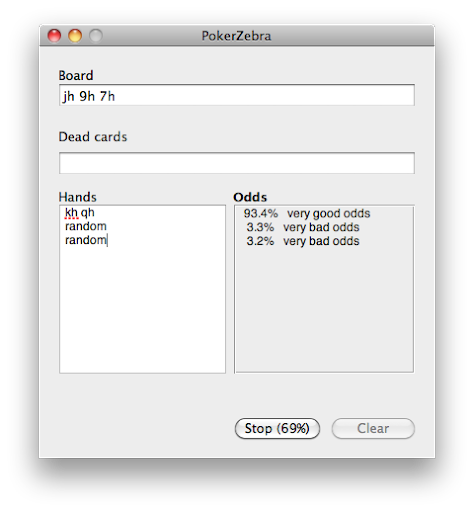 PokerZebra 0.4: Now with "random"
PokerZebra is the working name for a Texas Hold’em Poker Odds Calculator for Mac OS X. You can download PokerZebra 0.4 here. Leopard or Snow Leopard required. I suspect it will only work on Intel macs, but I could be wrong. You can now evaluate a hand against an opponent who has any two cards, by using the word “random”. Once I’ve fixed any issues that arise in this update, I can add specific ranges, such as AA (any two aces), 77+ (any pocket pair 77 or higher), or K3+ (any hand with a king and a 3 or higher). This works on Intel Macs running Leopard (Mac OS X 10.5) and Snow Leopard (Mac OS X 10.6). Perhaps I’ll be able to add PPC and Tiger support soon. No promises though. Specific hands (eg “Ah Kh”) are supported, as is random hands (“random”). Currently other ranges of hands are not supported. This will come soon.